Despite that, however, we all still love the movies. If you gave me a novelization of Casablanca, for example, I would be hard-pressed to say honestly that it’s better than the movie. There’s just something about movies, how they take images and ideas and just pour them into your head whole. Ideas and emotions flood your mind, evading the more analytical parts of your brain (if it’s a really good movie) and heading straight for the unconscious. 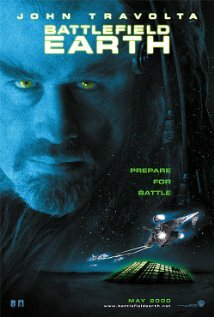 Clearly the alien dreadlocks are a poly-phallic symbol, representing the unrestrained patriarchal abuses committed by whomever let Travolta make this thing. Oh sure, you might analyze it later – take it apart for meaning and symbolism, dissecting the casting choices or praising the story arc. But for those couple of hours, when you’re staring at the screen, there’s magic happening. We’re lucky that we know what to do with it. On the Discworld, though, movie magic is something new, and something very, very dangerous. You see, one of the flaws of the Discworld is that it’s not horribly real. Not as real as our world, certainly, but just about as real as you can be, if you’re a flat world being carried on the backs of four elephants, who are in turn standing on a turtle that swims through the stars. It has been shown in many other volumes that reality on the Disc is negotiable and variable. And if something should come along to make the Disc slightly less real, then that could be a danger to everyone. In a dry and sunny place far from Ankh-Morpork, something stirs. Long held at bay by ancient rituals and safeguards, something primal has finally been allowed out into the world, and it seeks the minds of those who dream. It is the dream of a place called Holy Wood, and it is where reality itself may be torn asunder. It calls many people to create thse dreams. It calls young Victor Tugelbend, the best bad Wizard student in the Unseen University. He wants nothing more than to live a life of leisure, without actually having to work. It calls Silverfish, an alchemist who has very nearly mastered the art of making octo-cellulose. With it, he hopes to change the world. It calls Rock, a troll down from the mountains who dreams of doing more with his life than just hitting things. And it calls C.M.O.T. Dibbler, the greatest opportunist and worst entrepreneur in Ankh-Morpork. Without really knowing why, they all head to Holy Wood, where the sun always shines and the clicks can be made on the cheap. A strange city springs up, made not of solid brick and mortar buildings, but shacks with false fronts, a city that is completely modular and impermanent. There they build worlds and lives and, yes, dreams. Through them, the people of Ankh-Morpork can dream as well. All those dreams, though, are a shining beacon for Things that live beyond the boundaries of our universe. They seek the warmth and light of our world, and will exploit any opportunity to break through. By bringing dreams to life, the people of Holy Wood risk dooming the world to nightmares. I could, if I wanted, just start to catalog all the movie references that Pratchett makes in this book, but that would be ridiculous. Besides, someone has already done that for me, over at L-Space, and even they say it’s impossible to list them all. Suffice it to say, if enough people remember it from classic cinema, then it’s in this book in one way or another. If it’s a story told about Hollywood and they heyday of the studio system, then it’s in here too. Whether you’re an avid fan of the cinema or you just watch whatever your friends are watching, you should be able to get a lot of enjoyment out of this. The themes that Pratchett explores in this book are interesting, too. One of these is the nature of fame. In one scene, the Patrician of Ankh-Morpork, a man who holds the life of the city in his hands, is seated next to Vincent and Ginger, the Disc’s first movie superstars. Even though the Patrician has worked hard to become the ruler of the city, even though he is responsible for the lives and well-being of everyone in it, he is still far less famous and beloved than these two people who are famous just for standing in front of a camera and saying things. And even though he knows this, he still feels an odd thrill that he’s actually sitting next to them. In our own world, we hold celebrities to be almost apart from the rest of us – although that may erode slowly as social media such as Twitter and Facebook open up more and more of their mundane lives to their fans. Still, if we see someone famous in the grocery store or on the bus, we think, “Oh my god! That’s [famous person]! He’s buying broccoli here, just like me! !” Even though they are made of the same flesh and blood that we are, we perceive them as something Other, often even confusing them with the characters they play. In our world that’s merely annoying, but on the Discworld, it’s downright dangerous. The power of belief, coupled with Holy Wood’s need to make dreams into reality, are a potent and disastrous mix. As he does so often, Pratchett is using his world to comment on our own, and in doing so is taking note of the immense power that Hollywood has. I heard someone say once that America’s greatest export is unlike that of any other country. Our greatest export is Dreams. And dreams can be wonderful or they can be horrible. But their power to affect the world should never be underestimated.